Raise your hand if you are familiar with Reading Rainbow! If you aren't - where have you been? When my brother and I were growing up, we used to watch this show religiously. (I think I was even 14 at the time, to be perfectly honest.) LeVar Burton was familiar to me as Geordi La Forge on one of my all time favorite television shows, Star Trek: The Next Generation (which we'll talk about some other time). Recently we discovered (much to my great, joy-jumping delight!) that our local library purchased the entire DVD series (as best I can tell). We have been having a hay day, bringing home 2 or 3 at a time. My son (age 3 next month!) sits in rapt attention as LeVar combs beaches, goes bowling, milks cows and learns about a variety of musical instruments. These shows are absolutely perfect for where we are right now. They are right on target for his attention span and quest for knowledge and so I'm still just in love as ever with this show! 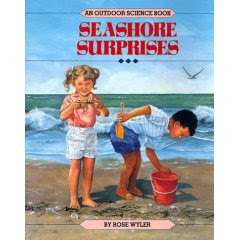 To take this apart by episode for you (just in case you have not yet had the pleasure of an introduction), we recently watched Seashore Surprises which highlighted the book of the same title by Rose Wyler. In this episode, LeVar visits an island off the coast of Florida. He does a little beach combing, pointing out sea corral that has washed up, as well as noting the difference in variety of seashells. He explores plants and animals that live along the seashore and even meets up with Christy, a marine scientist, and the two of them net some small sea animals for quick observation. We got to see a seahorse, something akin to a puffer fish (although they didn't call it that?) and a variety of other creatures. Lastly, we watched the tide as the sun set over the island. Each episode, beside focusing on the main title, also offers suggestions for three other like-minded titles for your perusal. On the back of each DVD case, you can find out which titles are reviewed in case you'd like to grab those while you are at the library also. All of the information is very conveniently laid out so that you, as the parent and/or teacher, can make the most out of using Reading Rainbow as a guide and friend. Even though some of the episodes are now 25 years, I still find them to be very relevant. LeVar is still reading books we are familiar with (some of which have become classics now) and still visiting places and talking about things that young kids care about. I love this show. I have a great appreciation for it and highly recommend it. I'm thrilled our library is cluing in! Believe it or not, my girls and I just watched an episode of RR on DVD that goes along with our Japan study TODAY! I'm so glad the episodes are available on DVD. I think most of them are timeless in that the stories are classic and the information still relative and interesting. They have the episodes on DVD?! I must look for that on my library's internet card catalog (or whatever they call it now)!! I loved this show! I grew up to be an avid reader too. This is great. I used to watch with my sister when we were younger. I can't wait to show these to my kids.